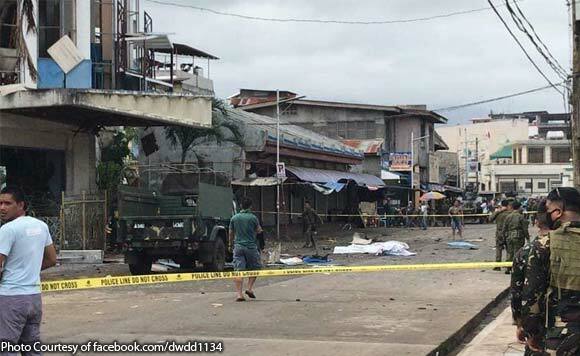 The military said that the Ajang-Ajang, a group linked to the Abu Sayyaf Group, was behind the twin explosions in Jolo, Sulu Sunday, January 27. “Based on the CCTV footage recovered by authorities, the Ajang-Ajang group perpetrated the said bombing incident,” the Armed Forces of the Philippines-Western Mindanao Command (AFP-Westmincom) said. Westmincom said that the Ajang-Ajang group was responsible for the killings of law enforcers, particularly soldiers and policemen in Jolo. Its members were also involved in other heinous crimes in the area, it added. At least 18 people were killed and 82 others were injured when two bombs exploded inside the Our Lady of Mt. Carmel Cathedral when a mass was ongoing and at its parking lot.